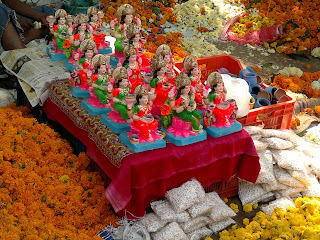 These are clay idols of Laxmi - the Goddess of Wealth taken during my recent visit to Pune. They are not factory made but are done by hand by individuals. Entire streets are lined with bright flowers in orange, red, white. The fragrance of jasmine garlands is in the air as people get busy shopping for their favourite festival - Diwali. Thanks very much for sharing this with us at I Saw Sunday. Please come and join us again, it would be lovely to see you. All those rich, bright colours are so cheerful - just right for Diwali, full of light.